It's that time of the year when pollution in India's capital becomes unbearable, courts upset people by restricting Diwali firecrackers, and the environmental authorities threaten draconian steps like banning cars. This is also the season for hand-wringing over the practice of burning crop residue in New Delhi's neighboring states of Punjab and Haryana, when soot blows toward the city. 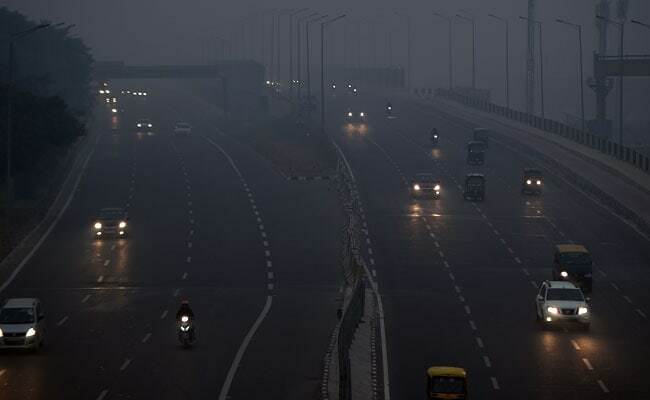 Scientists estimate that on Monday, one-third of the Delhi National Capital Region's overhang of harmful particulate matter, elements finer than a fraction of a human hair, derived from stubble burning. Including the capital region, India is home to nine of the world's 10 most-polluted cities. Beyond the health risks, the smog crisis threatens to erode competitiveness just when the country is starting to boast of rapid improvements in its ease-of-doing-business rankings. No matter how hard the authorities try to discourage private vehicles, shut down coal-fired power plants, or curb construction and heavy industry, Delhi's air quality stands no chance as long as 30 million tons of paddy stubble goes up in flames over 15 to 20 days. In late October and early November, pollution alternates between very poor and severe. A $1,900 Happy Seeder that plants wheat while mulching the paddy stubble isn't cost-effective for small farmers. Gathering up the residue is also problematic. Rural labor in prosperous Punjab increasingly consists of migrants who return home to celebrate Diwali. Burning the waste seems like the most logical solution to farmers, even though the villagers themselves are blighted by pollution. Delhi's air quality stands no chance as long as 30 million tons of paddy stubble goes up in flames over 15 to 20 days. The issue goes deeper than technology and labor, though. Paddy isn't a natural crop for the Punjab region. It guzzles too much water, and an over-reliance on groundwater (Punjab has more tube wells than farmers) has been rapidly depleting aquifers. But Indian policymakers want farmers to grow wheat and rice in order to feed a large and growing population without having to rely on imports. It was only in the 2000s that the severity of a burgeoning water crisis was understood. Since 2008, the Punjab government has delayed sowing of rice by setting a mandatory start date. This year, it was postponed by another five days to June 20 to save 2.4 trillion liters of water. 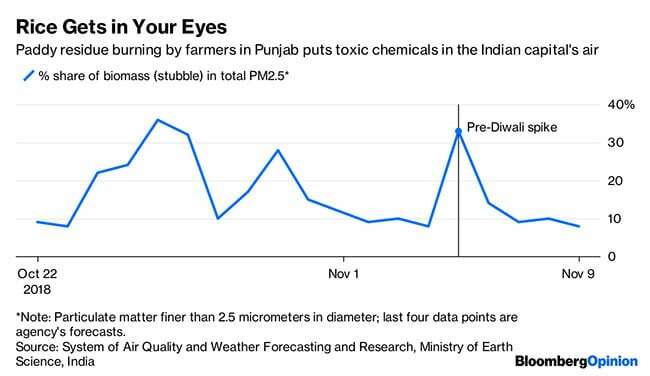 But later paddy sowing means even greater pressure after the harvest to clear the fields for wheat, and that's made Delhi's October-November air pollution even more concentrated, spoiling Diwali celebrations. Put another way, Delhi's air pollution is at least partly a water crisis in disguise. Weaning Punjab's farmers off rice would be next to impossible, and given the primacy of food security, politicians won't even seriously try. But it's time to recognize that halfhearted measures such as forced delays in sowing have environmental and economic costs that also must be weighed.